The African-American rhinoplasty typically consists of several basic maneuvers to change the shape of the nose. Augmenting a low nasal bridge, lifting/narrowing and strengthening the nasal tip and narrowing the nostrils serve as the typical foundation for this type of rhinoplasty. When done together an uplifted and more narrow nose can be created. While the thickness of the overlying skin will ultimately define the nasal shape, the augmentative effects always offer improvements. Some wider African-American noses with low tip projections, however, will need more aggressive nostril narrowing techniques. The length of the nostrils may need to be reduced in which the excisional pattern is full-thickness and goes to and around the alar-facial interface. This will not only bring the nostril base more inward but will also shorten it as well. Scarring in nostril narrowing is always a concern. But the scars typical do well. If inside the nostril rim only they are completely undetectable. For those nostril narrowing scar patterns that go outside the nose along the alar-facial groove, they also heal well if accurately placed right into the groove line. 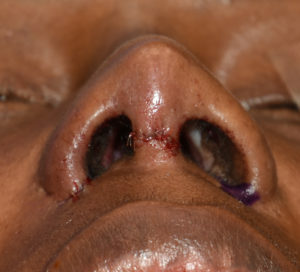 Keloids from nostril narrowing in African-American rhinoplasties is not a postoperative that I have ever seen.